EA Games chief Patrick Soderlund says he's not going to give up until he's number one. Back in the spring of 2011 when John Riccitiello still had a job, he did his best to build up the rivalry between Battlefield and Call of Duty as a true clash of the titans. "[Battlefield 3] is designed to take [Call of Duty] down," he said. "If you're looking for a battle of the titans, a Red Sox versus Yankees, if you're trying to understand if it's Microsoft versus Google and what the tip-off point is for this holiday season - this is it." And Battlefield 3 did pretty well for itself but Call of Duty is still the big dog, and while we don't have Riccitiello to kick around anymore, Soderlund is picking up his war-of-the-words torch. "Competition is good. It brings the best out of people. If there was only Battlefield or only Call of Duty, then the development teams might have been a little bit more content. We don't look at them necessarily and mimic what they do," he told MCV. "But we think about them." "Maybe they weren't thinking about us much when we made Battlefield 3, but I can tell you, they are thinking about us now. They need too," he continued. "We made a dent in the FPS market and we took share from them. And I am not going to give up until I'm number one and I am going to make sure I'm number one." 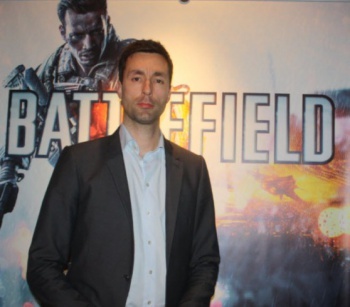 Soderlund said he believes EA has "the right team, the right product and the right strategy" to reach the top, but added that there's no plan or pressure to turn Battlefield into an annual franchise like Call of Duty. "We have other games now. We have Titanfall, which we didn't have when we had Medal of Honor," he said. "To me it is about a balanced portfolio." Battlefield 4 is scheduled to come out on October 29 for the Xbox 360, PlayStation 3 and PC, on November 15 for the PlayStation 4 and November 22 for the Xbox One.